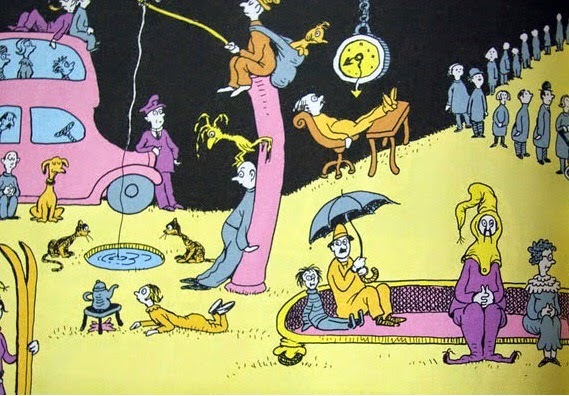 We're stuck in that place Dr. Seuss so famously dubbed "The Waiting Place." And with my very Type A personality, it's kind of a hard place to be. so I start planning minute details like how I'll make tethers to attach water bottles and backpacks to carseats to prevent children from dropping them on the floor during a potentially very long drive to our new home. Many big questions are hanging before us, and pretty much all we can do right now is wait. I found myself singing him "Lead, Kindly Light." "I do not ask to see the distant scene--one step enough for me." and ran up to the door of the room where storytime was held. I nervously eyed the older librarian watching them intently as she sat behind the checkout counter. "No running, boys!" I sheepishly reminded in my whisper as I caught up to them and walked with them into the room. They eagerly took their seats and were excitable participants in the discussions and songs. After finishing our crafts, I led them back to the checkout counter and the librarian who had watched them earlier. I was embarrassed again as I presented three books that had been damaged when they were left within Lincoln's reach and explained what had happened so I could pay the dues. The librarian greeted us with a smile. "I saw these boys come in here with such huge smiles on their faces! I thought, somebody loves story time!" She patiently surveyed the ripped pages and, with the help of another librarian, determined that our amount due came to a grand total of $0. They brushed away the problems by claiming that the binding was weak on Blueberries for the Queen, they had newer copies of If Rocks Could Sing, and some book tape would make a quick fix on Goodnight, Goodnight Construction Site. "Are you sure?" I questioned. "We're happy to pay." They reassured me that it was no problem. but I wanted to renew just one book. I guess she could tell that it wasn't just because we loved the story so much. Somehow that little book had made its way into a hidden corner of the house. "Well, we'll just renew all of them, and then when you return the ones you have they'll come off, okay? That way you can keep whatever you need to. I know when you have little ones sometimes it's hard to keep track of them all!" I wish my simple "thank you" could have expressed my sincere gratitude for her patience and understanding toward my little family more fully. Inconveniences we experience in our interactions with others are just a part of life. And when others are patient in response to the problems I create, there wells up within me a desire to show the same tolerance and understanding toward those who may learn lessons at my expense. Because we all take our turns on both sides. And in the meantime, we'll keep searching for There's a Nightmare in my Closet. but it was definitely good for some laughs. Okay, it was probably just mean to do it to Lincoln. **No tears were shed, and no children were hurt in the making of this blog post. Tuesday is supposed to be bathroom cleaning day. I really, really don't like to clean the bathrooms. I like cleaning in general (washing dishes is my favorite chore), but I kind of despair when bathroom cleaning time comes along, and I'm far too good at finding reasons to put it off. and Sam came in and attempted to steal the cleaner and finish the job. and then in the midst of the dispute, I said, "Let's race!!" before the terms of the game were in place. and steal the glass cleaner to slow him down. I erupted into laughter when he attempted to clean the toilet with the duster. Looks like I should delegate bathroom cleaning to Sam more often. He laughed along with me and asked if I still wanted his help. Maybe they won't let you wash the dishes anymore! Sometimes it's hard to blog every weekday. motherhood usually consists of a lot of the same things done over and over. It's been an interesting experience to try to find something blog-worthy every day. Today I almost missed my goal! of carrying a small notebook around with him and writing down inspirational quotes he heard or insights he had throughout the day. I decided to copy him, so I picked up a cute notebook from the BYU bookstore and began carrying it around with me everywhere. I would write in it frequently and read it during short waiting periods. Last night I pulled out that first notebook and began flipping through the pages. -"There is no opposition that we experience in life that isn't meant to translate into joy." 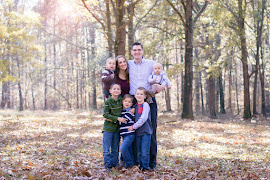 -"Every good quality we possess is an expression of God's love and Fatherhood." -"Pondering takes things from the mind to the heart." -"Generate light instead of heat." -"Fear and force have no place in the Kingdom because they do not produce moral actions, and are contrary to God's gift of...agency." -"Opportunity is missed by most people, because it is dressed in overalls and looks like work." -"The things we put into our souls define our character and individual identity." -"Character is not developed in moments of great trial or temptation--that is when it is used." -"We don't deserve anything, but if we receive a blessing, we are worthy of it. There's a difference between deserving something and being worthy of it." -"If we aim at self-fulfillment, we will never be fulfilled." to play at a park and splash pad. Just as we were arriving, a major downpour started. We were soaked to the skin! and huddled up there thinking maybe the rain would stop since Texas is known for its sudden, short-lived crazy rainstorms. and I couldn't get over how funny it all was. "It is like fifty-seventy-five degrees out here!" Eventually we just had to admit the storm wasn't passing and head back to my friend's house. And wouldn't you know it, just as we were getting back to her house the sun came out. So we stopped at another park and played. "Come What May and Love It" by Elder Joseph B. Wirthlin. Doesn't this section bring a smile to your face? "I remember loading up our children in a station wagon and driving to Los Angeles. There were at least nine of us in the car, and we would invariably get lost. Instead of getting angry, we laughed. Every time we made a wrong turn, we laughed harder. "Getting lost was not an unusual occurrence for us. Once while heading south to Cedar City, Utah, we took a wrong turn and didn’t realize it until two hours later when we saw the “Welcome to Nevada” signs. We didn’t get angry. We laughed, and as a result, anger and resentment rarely resulted. Our laughter created cherished memories for us. "I remember when one of our daughters went on a blind date. She was all dressed up and waiting for her date to arrive when the doorbell rang. In walked a man who seemed a little old, but she tried to be polite. She introduced him to me and my wife and the other children; then she put on her coat and went out the door. We watched as she got into the car, but the car didn’t move. Eventually our daughter got out of the car and, red faced, ran back into the house. The man that she thought was her blind date had actually come to pick up another of our daughters who had agreed to be a babysitter for him and his wife. "We all had a good laugh over that. In fact, we couldn’t stop laughing. Later, when our daughter’s real blind date showed up, I couldn’t come out to meet him because I was still in the kitchen laughing. Now, I realize that our daughter could have felt humiliated and embarrassed. But she laughed with us, and as a result, we still laugh about it today. "The next time you’re tempted to groan, you might try to laugh instead. It will extend your life and make the lives of all those around you more enjoyable." My sister and I used to build forts every Sunday night before a Monday holiday. and sore muscles from sleeping in our tight, awkward quarters. It was a highlight of my childhood. Lucky me--I get to teach these little ones the wonder of fort-building!! Books are about the only non-essential item I frequently buy. and we try to buy at least one each week from the library. We have lots and lots of favorites--here are some we've been enjoying lately. 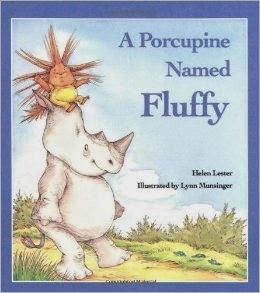 This adorable book features a porcupine who is discontented with his unusual name--until he meets a rhino with a name just as goofy. 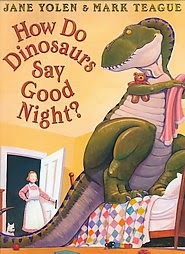 We love the Dinosaurs series (along with just about every other American kid). 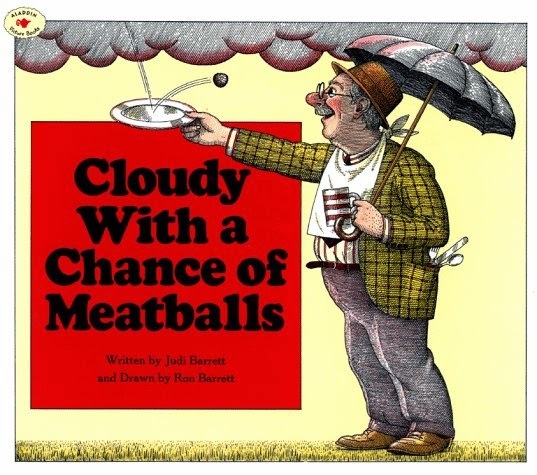 The pictures are hilarious and the rhymes are catchy. And each dinosaur's name is hidden in the picture! 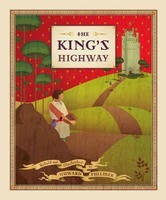 My boys love that this book has a knight in it. I love the moral it teaches. 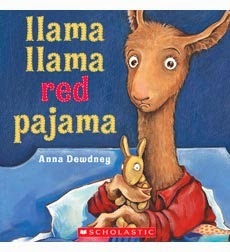 The Llama-Llama books are as fun to read as they are to hear! 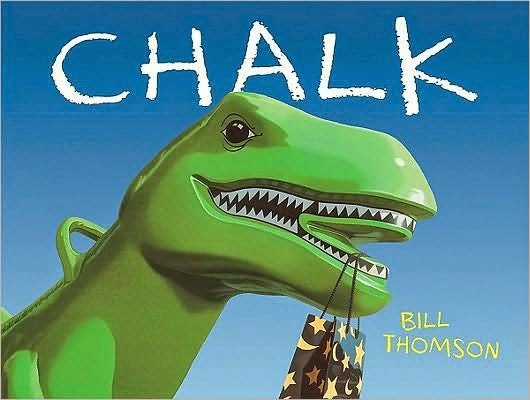 This clever wordless book features a group of children who find a bag of magic chalk and get themselves into a bit of trouble when they draw pictures that come to life. 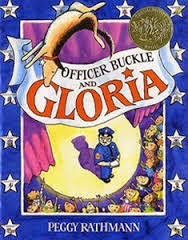 Since it's a Caldecott winner, you'd think it would be more popular, but even the librarian didn't know about this book. 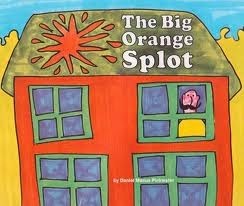 It was one of my favorites as a child! Good old Tacky. 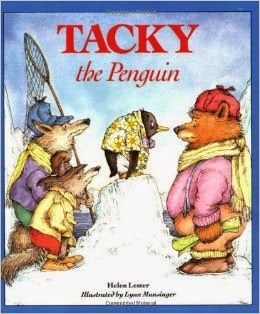 I loved this book as a child and I still love it--and the lesson that we can appreciate everyone even if they seem a bit strange. 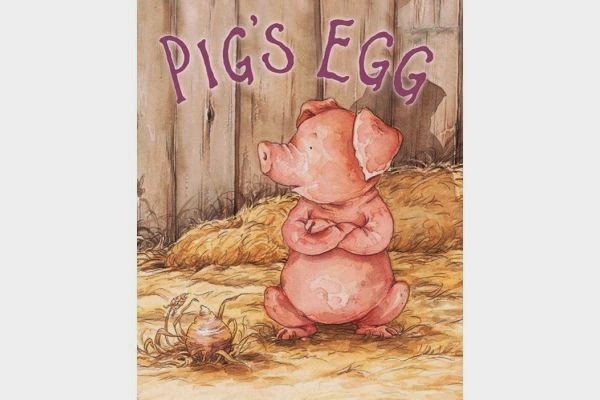 This is such a sweet story about a pig who feels left-out because he can't lay eggs or fly like his farm friends. One day he finds a turnip and thinks it is his egg--and the "baby" that comes out of it and learns to fly is such a fun surprise. 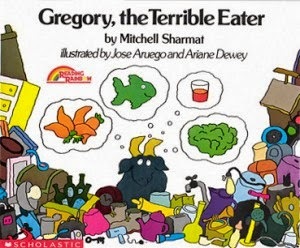 This book was read to me many times when I was a child--it didn't help my picky eating, but I did love it, and my kids do, too! This story of a goat who only wants to eat nutritious foods is fun for all ages. Mr. Plumbean teaches that we should chase our dreams and not worry excessively about being just like everyone else. Who doesn't love this book? 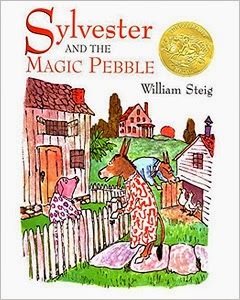 Although, as a parent, I get a pit in my stomach when I think of poor Sylvester and his parents' misery when they couldn't find him. This is a timeless story. 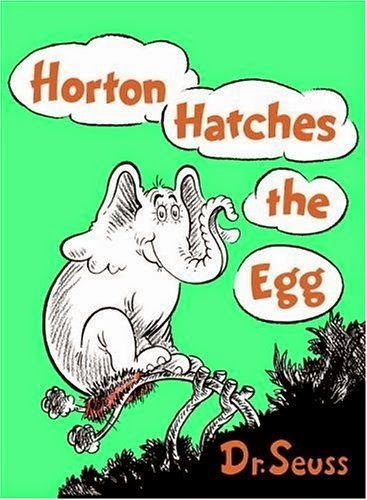 We have many of Dr. Seuss' books, but this one is our favorite. Horton teaches in such a noble way to be "faithful, one hundred percent!" Maybe people are more familiar with this movie than the book, but the book is wonderfully entertaining. 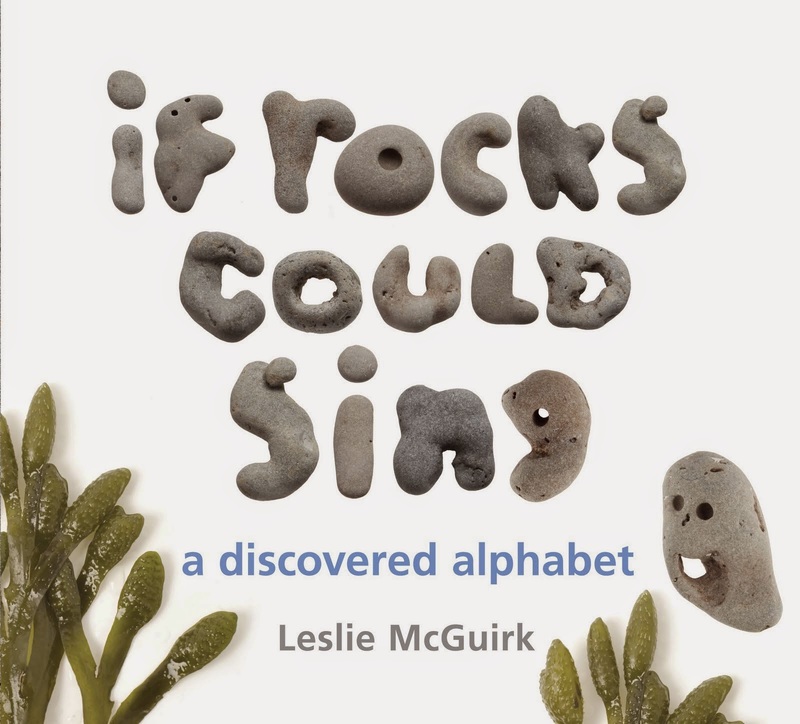 This alphabet book features pictures of rocks the author found on a Florida beach. It's so clever! The letter 'k' took her years to find. 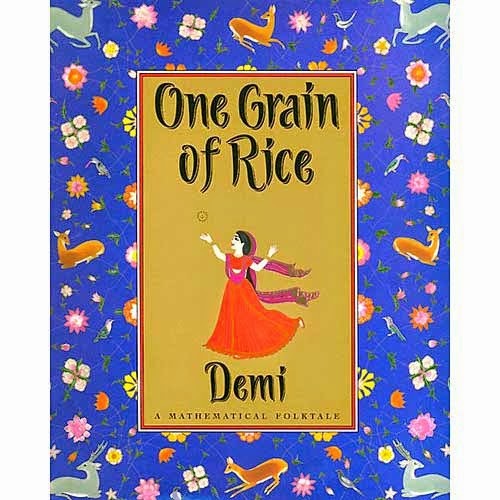 I haven't read this one to my kids yet, but I remember loving the tale of a girl who convinces the greedy emperor to give her a grain of rice--doubled each day for a month. It's such a fun math book! So, now that I've shared some of our recent favorites, what are some of yours? All five of us here are kind of smitten with this smoothie. It is so refreshing, and the lime juice creates an almost fizzy feeling to it. The ingredient amounts are very flexible, of course, so feel free to play around with them to suit your tastes. I love using home-canned pineapple, but canned pineapple from the store would work as well. I don't suggest using fresh pineapple, as the taste is more acidic and it has a tendency to overpower the other flavors. Also, I like to freeze my bananas when they're slightly underripe. I just peel a bunch and put them in a gallon ziploc bag for use in smoothies. If the peel has brown spots at all, the banana taste is too much for me, so I like to freeze them when they are still tinged with green. Combine ingredients in blender. If your blender isn't very powerful, let the fruit sit for 5-10 minutes to soften up a bit before blending. Blend until smooth, adding milk, lime juice, and sugar as needed. (And don't be shy with the limes! This tastes best with a pretty good lime flavor, so if your limes aren't very juicy you may need to add more.) Enjoy! and I was fortunate enough to spend the day with my sweet ones! my birthday was a nice break from mishaps. The free meals and ice cream from restaurants were nice perks, too. and just as I was leaving to pick up Sam the missionaries pulled up and said, "We have a present for you!" I exclaimed, "How did you know it was my birthday?!" They were stunned. They had randomly made brownies to bring to us--not even knowing about our broken oven! It kind of made my day. Sam planned my very most favorite meal. I could gladly eat cold cereal 3 meals per day! involving crepe paper and glow in the dark balloons. and Sam gave me this book. I consider myself a "practical romantic." expensive jewelry, or exotic vacations. and randomly leave me poems and love notes. And I think "A Bicycle Built for Two" is one of the most adorable love songs ever. and reading letters from another "practical romantic" to his wife brings a smile to my face. 25 is off to a great start. It's going to be a year filled with changes. and today I had to buy him diapers for the first time. with unbelievably thoughtful friends and family? P.S. I'm 25 today. I remember as a child, hearing the superstition that Friday the 13th was bad luck, and then my birthday fell on Friday the 13th and it included stepping on a half-living, Texas-sized cockroach with my bare foot, which it clung to with its sticky, wretched feet. I sincerely hope today is cockroach free. to work during the few months before he started college at BYU. silently handing them a box of fruit from the company he worked for. or maybe an invitation to a conference or event. Sam is 6'4", and pretty much everyone who saw him was terrified. he began violating the rule to not speak and explaining the little he knew in his muffled, gorilla-covered voice. 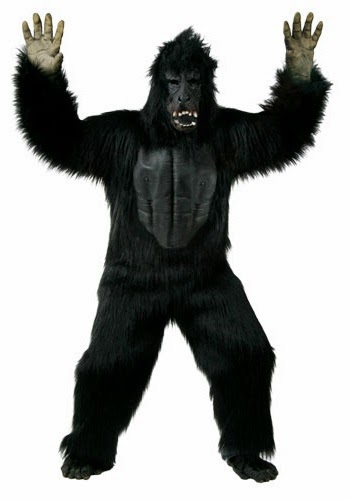 morphing into a package-delivering gorilla. and he was very relieved when he was moved to something else. cost-of-living, weather, crime rates, academic programs, and lots of professors. Our possibilities are gradually narrowing down and it's a rather exciting process! Sam's set to defend his thesis at the end of August. Yesterday he spoke with a professor from Columbia University. They're interested in having Sam do his fellowship there. but for a while I entertained thoughts of our conservative little family living in New York City! 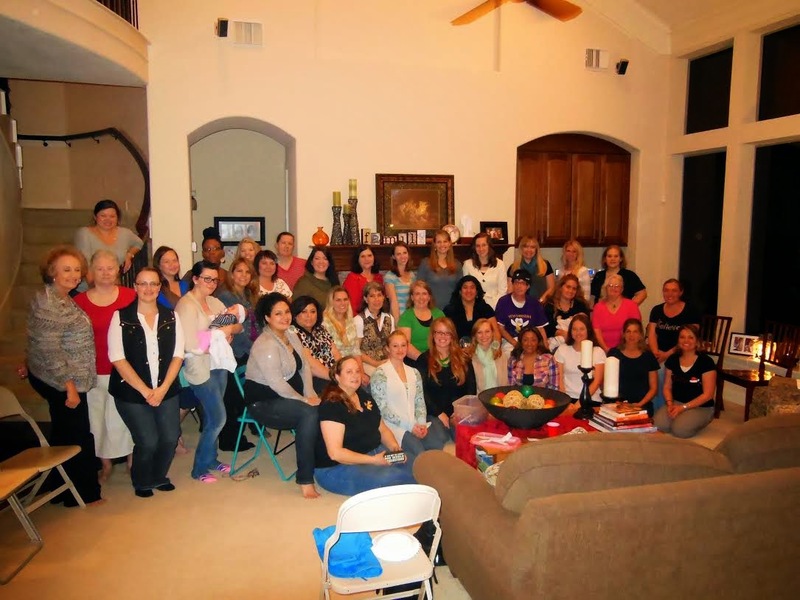 We share your outrage at the deeply troubling allegations against Dr. Karpen in Houston. No right is more fundamental than the right to life. And no life is more in need of protection than that of an innocent newborn child. 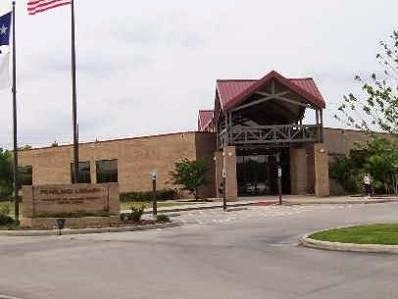 Because the alleged crimes occurred in Harris County, Texas law gives the Harris County District Attorney the sole power to prosecute this case. For that reason, we immediately contacted the Harris County District Attorney’s Office upon learning of these allegations. We offered the District Attorney any assistance our office can provide. We also offered to facilitate coordination between local authorities and the Texas Rangers as the investigation proceeds. While we lack the legal authority to initiate a prosecution in this case, we stand ready to provide any necessary assistance to those who have that authority. We will continue to closely monitor the situation until these shocking allegations have been fully investigated and any guilty parties brought to justice. Again, thank you for writing. General Abbott always appreciates hearing from concerned citizens. I'm well aware that my e-mail was likely not alone in evoking this kind of response. But I was greatly encouraged to see that, even on a state level, my voice was actually heard. I later learned that an investigation is currently underway. This has been just one experience of several as of late that has motivated me to make a stand when something isn't right and to make my voice be heard. I often think of the scripture found in James 1:22 that states, "But be ye doers of the word, and not hearers only." I hope that in the future I will do more than shake my head at troubling policies, wring my hands as I wonder what kind of world my children will grow up in, and wish for the generally accepted morals of the past. As I view the moral disintegration of our nation and the world around us, I hope that I can play a part in standing up and making my voice be heard in support of truth, justice, and morality. Once, when Talmage was a baby, Sam asked me what the hardest part of being a mother was. I told him I thought the hardest part was worrying about my child and watching him suffer at times. another that comes to mind now is disciplining. pondering and studying to try to make discipline more effective and less painful (for parent AND child). "When persons manifest the least kindness and love to me, O what power it has over my mind, while the opposite course has a tendency to harrow up all the harsh feelings and depress the human mind." "[Parents], if you wish your children to be taught in the principles of the gospel, if you wish them to love the truth and understand it, if you wish them to be obedient to and united with you, love them! and prove to them that you do love them by your every word or act to them. For your own sake, for the love that should exist between you and your [children]--however wayward they might be...when you speak or talk to them, do it not in anger, do it not harshly, in a condemning spirit. Speak to them kindly; get them down and weep with them if necessary and get them to shed tears with you if possible. Soften their hearts; get them to feel tenderly toward you. Use no lash and no violence, but...approach them with reason, with persuasion and love unfeigned. ...Get them to feel as you feel, have interest in the things in which you take interest, to love the gospel as you love it, to love one another as you love them; to love their parents as the parents love the children. You can't do it any other way." On Saturday night I was using my laptop, and the cord was having some issues. It's been struggling for a few weeks now. I jiggled it to make it start charging, like I always do, and suddenly smoke started pouring out! I instinctively jerked the cord out and threw it across the room. Needless to say, I won't be using that computer until we get the cord issue resolved. My post feels so bare. Wesley's story-of-the-day occurred this morning when I was telling the kids a story about a time when my friend's little brother came and destroyed a big project my friend and I had been working on. Wesley gasped with excitement and said, "I know what we could do!" That boy is a laugh a minute these days. Today Talmage and I went to see "The Magician's Nephew" at Miller Outdoor Theatre. from March through October and children's performances during the week in the summer. I knew we had to go. We got a babysitter for the younger two kids and Talmage and I went on our little outing. The play was great, and they did a good job covering the main points of the story in just 45 minutes. It was the perfect length of time for his 4-year-old attention span. We even got a picture with Digory afterwards! but Sam was going to meet up with us for the play since it was just down the street from his hospital and he arranged to take a long lunch. and another 30 minutes searching and waiting for us. Did I mention he was really sick as well? and he had all but decided that our car had broken down and that was why we were nowhere to be found. In case you're wondering, it was totally my fault. He was really sweet about it all and insisted that he will be getting me a cell phone. I've lasted the last 2 years or so without one! It was a nice little outing in spite of all the trauma. Sometimes I feel like I live in a jungle. On Monday the boys were fighting ALL morning long. If it wasn't one thing, it was another, and I was getting pretty exasperated. "We are DONE with this fighting! I have had it! This has got to stop!" I even shook my hands in front of me in a frustrated way. As you can see, I was really losing it (insert sarcasm). "I just said a prayer that you can be a better Mom. And always talk so nicely to us." and I had the dough spread out all along the counter. while claiming repeatedly, "I'm not going to touch it! I'm not going to touch it, Mommy! when we really ought to get down and go play with something else. we head down a very slippery slope. I have such fond memories of Guru's because that is where Sam and I went on our second date. He recommended the cilantro-lime quesadilla, and I was highly impressed with him and the food. So when Mom wanted to take me out to lunch one time, I suggested Guru's, and while we were there she made the enlightened decision to order some sweet potato fries. That was the beginning of the end of our days in Provo, sadly, but Mom and I managed to get those fries at least a couple more times. Preheat oven to 425 degrees. Drizzle olive oil over the top of potatoes and toss to coat. Sprinkle seasonings on potatoes and toss again. Spread in a single layer on a baking sheet. Bake for 20 minutes and carefully flip with a spatula. Bake for another 15-20 minutes or until browning on the ends. Enjoy! For the sauce I just combine equal parts honey bbq sauce and sour cream mixed with this seasoning (1 small carton to 1 Tbsp. of seasoning). Even Talmage loves these (probably because they are dipped in sour cream), so they must be good! Hey, guys, wanna see a cool trick?